When last they met, the Eagles and Vikings were vying for a spot in the Super Bowl. Now they are searching for consistency. Coming off its championship season Philly has won twice at home and fallen twice on the road, last week blowing a 14-point lead to lose in overtime at Tennessee. The defense remains stout much of the time, but fell apart in key spots at the Titans, especially in OT. Minnesota’s dilemma is deeper. While the Eagles are just a half-game out of the NFC East lead, the Vikings are 1-2-1 and trail Chicago and Green Bay in the NFC North. Most important, Minnesota must find a running game, ranking last. If Dalvin Cook can get healthy, it would be a huge help. The weekend began Thursday night with New England’s 38-24 home victory over Indianapolis. Tom Brady reached 500 touchdown passes and New England (3-2) won its second straight after a mediocre start to the season Brady also tied Colts kicker Adam Vinatieri, a former teammate, for most NFL victories with 226. Indianapolis dropped to 1-4. Off are Tampa Bay (2-2) and Chicago (3-1). The Seahawks‘ former Legion of Boom might have given LA’s booming attacking fits. This group, while well coached and aggressive, figures to struggle with an offense that comes with 10 days off and has three wideouts who eclipsed 100 yards receiving last game: Brandin Cooks, Cooper Kupp and Robert Woods. 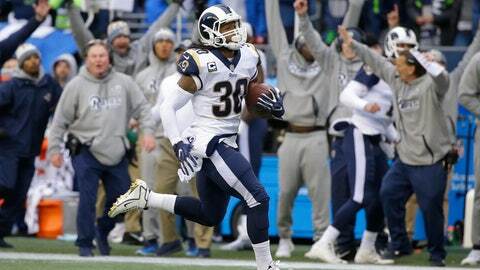 Plus, the Rams are no slouches on defense. Seattle’s season, despite two straight wins, got messier when it lost star safety Earl Thomas (broken leg) and tight end Will Dissly (patellar tendon) for the year. Thomas’s parting gesture to the Seahawks sideline was not quite complimentary. Despite some awful statistics including being outgained by 435 yards and outscored 90-82, Miami leads the AFC East. Of course, it was routed in New England last weekend. The Dolphins do lead the league with nine interceptions. Also on top of their division, tied with Baltimore in the AFC North, the Bengals are struggling on defense, too. They rank last on third downs, allowing opponents to convert 57 percent. But the offense has sizzled, especially in the red zone: Cincinnati has scored in its past 34 trips, the longest active streak in the NFL. Here’s a matchup the former team from Cleveland loves. Baltimore has won five straight and 18 of the past 20 meetings under coach John Harbaugh. While defense always is the calling card for the Ravens, Joe Flacco has eight TD passes, only two interceptions, and Justin Tucker could make field goals Sunday kicking from Lake Erie. Oddly, this is the final intradivision road game for the Ravens, who beat Pittsburgh and lost to Cincinnati. Cleveland can play some D, too. It has a league-high 13 takeaways and DE Myles Garrett, the top overall choice in the 2017 draft, has 4 1/2 sacks this season and 11 1/2 in 15 games. He made a career-best nine tackles last week in an OT loss in Oakland. A matchup of elite AFC teams in which Kansas City’s powerful offense led by emerging star quarterback Patrick Mahomes (14 TD passes, no interceptions, NFL-best 15 passes of at least 25 yards) faces the league’s best defense. Jacksonville excels particularly in pass coverage, and the perspective matchup of cornerback Jalen Ramsey vs. wideout Tyreek Hill is a juicy one. The Jaguars haven’t allowed an opponent to score on its opening possession this season. The Chiefs have scored 52 points in first quarters. A major test for the Redskins, coming off a bye and alone atop their division. The Saints showed against the Giants that they can win without Drew Brees putting on an aerial spectacular as Alvin Kamara scored three TDs rushing, Wil Lutz kicked four field goals, and the defense mostly befuddled New York. Washington’s defense has been surprisingly effective, ranking third overall. It must slow Brees, who has 71,740 yards passing, needing 201 to move ahead of Peyton Manning for the career lead. He’s passed for eight touchdowns with no interceptions, and has rushed for two TDs. Which of these supposed contenders has been more disappointing? The Falcons have been hammered by injuries on defense, down three starters already, placing an extra burden on the offense. Mostly, Matt Ryan, Julio Jones and company have come through — Atlanta has scored 116 points but allowed 122; only Tampa Bay and Oakland have been more generous. Pittsburgh’s issues seem to run deeper than a porous D and too many turnovers, a league-worst nine (tied with the Bucs). The Steelers are runaway leaders in penalties, are missing star RB Le’Veon Bell in a contract dispute and are enveloped in far too much drama. Both teams can move the ball and are vulnerable on defense, so a shootout might be in the offing. Derek Carr is fourth in the league in completions (120) and completion rate (71.0 percent), and the Raiders are one of three teams with a 100-yard receiver in every game this season. Los Angeles is more balanced. Melvin Gordon leads the AFC in yards from scrimmage (475) and first downs (25), and backup RB Austin Ekeler is averaging 8.6 scrimmage yards, tops for his position. Philip Rivers likes facing the Silver and Black having thrown 41 TDs vs. the Raiders, tied with Denver for his most against any opponent. Look for the Panthers to get off to a running start coming off their bye. They are No. 1 in rushing offense and the Giants are No. 29 in run defense. Panthers RB Christian McCaffrey is coming off a 28-carry, 184-yard performance against Cincinnati. New York doesn’t score much despite two dynamic performers — WR Odell Beckham Jr. and second overall draft choice RB Saquon Barkley. But the rookie can become the third NFL player with at least 100 yards from scrimmage in his first five games, joining Adrian Peterson and Kareem Hunt. Aaron Rodgers is 13-3 against Detroit, but to win this one he might turn to his running game with his backfield banged up. The Lions rank last against the run, and Green Bay has a three-pronged attack. Although rookie Kerryon Johnson has spurred a decent running game for the Lions, they probably will concentrate on Matthew Stafford throwing to WRs Golden Tate, Marvin Jones and Kenny Golladay — the first trio of NFL teammates with 50-plus yards receiving each in five straight games played together. Coming off a spectacular rally to beat defending Super Bowl champion Philadelphia, the Titans are riding high. Expected to be potent rushing the ball, they’ve been so-so. But Marcus Mariota finished 30 of 43 for 344 yards and two touchdowns, plus a TD rushing against the Eagles, and Tennessee converted three fourth-down plays, one by penalty in overtime. The Bills got back to looking inept at Green Bay after that shocking win at Minnesota. They were shut out for first time since 2008 and had 145 yards offense, matching their fewest since a 40-7 loss at Chicago in 2006. Not exactly Santa Anna vs. Davy Crockett at the Alamo, this Texas showdown looks more like a skirmish. The Texans were ballyhooed as a club ready to rise as they got back the likes of J.J. Watt and Deshaun Watson. The first time they rose was last Sunday at Indianapolis, and they needed overtime and a gamble by Colts coach Frank Reich that backfired to get their lone victory. Dallas got its offense on track in beating Detroit and faces a mediocre pass defense. Problem is, the Cowboys rank 30th in passing and workhorse running back Zeke Elliott might be their primary receiver, too. Since the Texans won their NFL debut against the Cowboys in 2002, Dallas has taken the next three meetings. Both sides got off to nice starts in 2018 and now are struggling. New York has little offensive flair behind rookie QB Sam Darnold, which was to be expected. He’ll face another difficult defense that can pressure the quarterback: Denver has 10 sacks, four by All-Pro Von Miller. The Broncos can run the ball with a pair of solid rookies, Phillip Lindsay and Royce Freeman, but Case Keenum has three touchdown passes and twice as many picks. This would seem a good spot for the Cardinals to eliminate that zero in the win column, the only team owning one. But the Niners, despite losing QB Jimmy Garoppolo, showed plenty of fight in their loss to the more talented Chargers. While the overall league is scoring at a record pace, Arizona has 37 points. Through four weeks, 13 teams had scored at least 37 points in a game.